Overseas study gives you the opportunity to travel while gaining degree credits, providing opportunities for personal growth and improving employment options. It also looks great on a résumé and may give you a competitive edge in a tight employment market. Study options vary from 2 weeks to 2 semesters. We have partnerships with about 90 institutions in 35 countries around the world, providing you the opportunity to study for one or two semesters. Exchange allows you to immerse your self in new cultures, develop lasting friendships and get a new perspective on life. The study abroad program allows students to study at overseas non partner institutions. The point of differentiation from our exchange program is that you will be directly applying to and paying tuition fees to the overseas institution, not ECU. As well as Exchange and Study Abroad options, ECU has a range of Study Tours, Internships and Short Programs available for students to take part in. 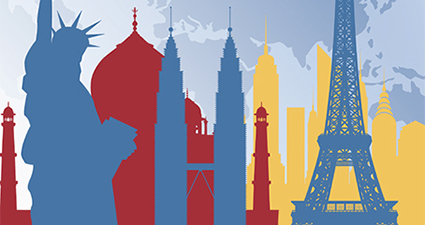 An array of financial assistance is available to ECU students taking part in overseas studies.